Just today I finished knitting this jumper for my niece Lily. Like most of my projects, it looks better photographed than in real life. But it does feel good to have seen it through to the end, even if the tension is uneven and there are holes where I switched colors. 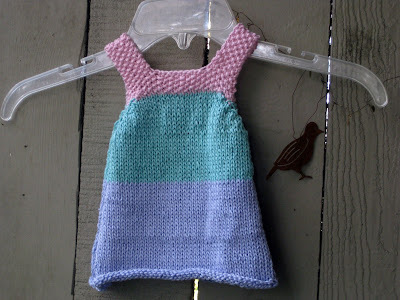 The pattern is Little Girl's Jumper or Sundress. Lily will have to wait until she is one year old to wear it. By the way, here is Lily. She is three months old now and so beautiful. I taught myself new stitches this summer, and this one worked out well for a kitchen towel. It's a little scary, but I can't remember which stitch this is and where I got it from. Yikes. These are cotton swatches knit in new-to-me stitches from my Vogue Stitchionary. I'll probably give them to my sister to use as baby wash cloths. Yay! I can't wait for Lily to wear her jumper! I knit lots of socks! Oh how fun -- that little Lily is adorable. 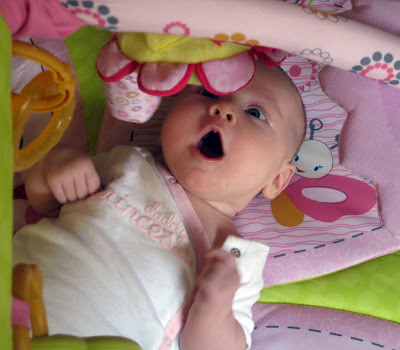 I saw a little smiley 5 month old tonight -- isn't it fun to have a baby around? Your little dress looks really cute! My summer hasn't been very fruitful -- too much work! It is lovely to hear from you again Stacy! Lily is gorgeous and your knitting projects are beautiful. That jumper is SO cute! I'm guessing that Miss Lily will be wearing it before you know it. "One year old" size isn't really fit for a one year old baby. Wouldn't it be cute with a long-sleeved white shirt? Make sure you take pictures! Well, that little dress is precious and so is Miss Lily:) I didn't make anything so you have lots more than I do to show! Hope you are enjoying this ALMOST Fall day my friend, HUGS! I live, love, love that dress. Babies are so fun to king for. 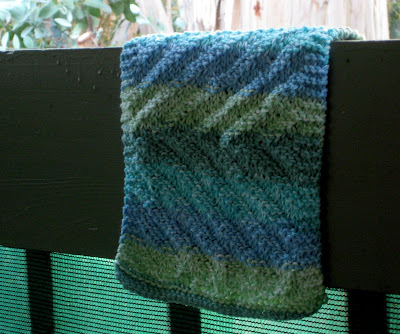 I haven't done much knitting lately and I'm dying to start a new project! The jumper dress for Lily is so so so precious! You did a fabulous job with it. I may want to learn how to knit that! 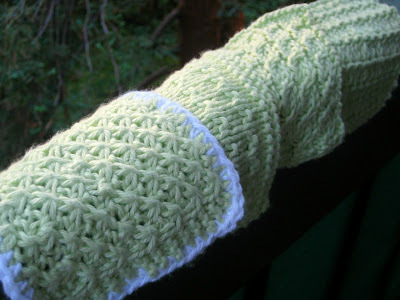 Great to see all the new knit projects you've been working on since July. And Lily is beautiful, I'm sure she'll love her jumper when she grows into it!